Hi. My name is Steve, and I’m a Mainliner. Through all my years as a Fundamentalist, then an Conservative Evangelical, then some variation of Emergent, I have been a member of The United Methodist Church, a mainline denomination. I believe this is where God has called me. Plenty have tried to convince me otherwise. I’ve sat face to face with some of the leaders of the Emergent movement and heard them explain, with rather convincing rhetoric, why getting out (of the mainline) would be a good thing. Yet here I stand. I can do no other. 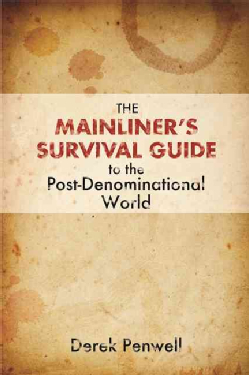 Perhaps, then, you can imagine how appreciative I was to find Derek Penwell’s The Mainliner’s Survival Guide to the Post-Denominational World. Here was a book written from inside a mainline denomination, yet, ostensibly, with the recognition that the glory days of American Denominationalism are clearly gone and not returning. Let me be clear: I wasn’t hopefully expecting Penwell to make it sound ok. The last thing I wanted was some platitudes encouraging me into hospice care as the denomination and its version of Christianity continue to linger. Reading Diana Butler Bass’s Christianity for the Rest of Us brought me such great joy when I read it almost a decade ago that I bought a dozen or so copies and offered them free to any clergy friends who would agree to read the book. I would consider doing the same with this book from Derek Penwell. The book opens with what I find to be a stellar comparison of our times with post-Revolutionary War American. I found this comparison helpful and Penwell’s historical work insightful to the point of making me wonder why I hadn’t read this elsewhere. Penwell does an excellent job, I feel, of stirring up the conversations that must happen. Mainline denominational folk know that something is wrong, but this book offers to help us identify and make corrections without simply trying to keep up with whatever the ecclesiology-of-the-month might be. This just got added to my “read this” list. Thank you for the review.